Questions about the beef industry? This page is intended to provide answers to commonly asked questions, and give you a foundation of knowledge about how cattle are raised. Whether you have questions about the nutrition inside that juicy burger or steak you love to eat, or you want to know what cattle eat to make that possible, you can find the information here. What is the Beef Lifecycle? The more you know about how beef is raised, the easier it is to make choices and understand what you're buying. Of the protein sources coming from animals, cattle have a unique life cycle that typically results in movement - to different pastures and different farms as they grow over the course of 2-3 years. Follow the graphic to see how it all results in safe, high quality beef. "Farm to Fork" is the result of generations of learning and evolution. While this is the most common path to getting beef to your table, it's truly the result of independent decisions made by individual farmers and ranchers everyday. Farmers and ranchers make the best decisions they can based on generations of knowledge, current science, their resources, and a desire to see their way of life flourish for generations to come. What is done to provide good animal welfare standards for beef cattle? If you asked a farmer or rancher their reason for getting up in the morning (and sometimes, in the middle of the night), the likely answer would be "caring for my cattle." This commitment drives the modern cowboy to use generations of knowledge, research, and improvements in our understanding of what cattle need, to provide the best standard of animal welfare for their cattle. There is no acceptable level of abuse in the process of raising cattle. Period. The beef community's Beef Quality Assurance program is a free program for farmers and ranchers of all sizes to understand and adopt the use of best practices. Farm owners and their staff complete the training, take advantage of continuing education on animal welfare standards, and post information and manuals in places where cattle will be handled, for example where they are unloaded from trucks, to where they may receive treatment for illness. "Any individual who witnesses inappropriate cattle treatment is responsible for making every effort to stop it immediately. Anyone who mistreats animals must be reported immediately, and should be punished in accordance with the law." Cattle are raised in very diverse environments and geographic locations in the United States, by independent farmers and ranchers, so there is not one specific set of practices that can be recommended. Personal experience, Beef Quality Assurance training and professional judgment can serve as a valuable resource for providing proper animal care. But what about those undercover videos of abuse on farms? Read this article to know what the beef community thinks about videos portraying animal abuse. The "BQA" program is a free tool developed to help everyone who raises cattle have knowledge of science-based best practices. The beef community invests millions in research to improve our understanding of cattle and providing the best care. The BQA program gets these findings out to all farmers and ranchers to help them do the best job they can caring for cattle everyday. Are antibiotics necessary in raising beef cattle? The short answer is, yes. Antibiotics are just one important tool in the toolkit for managing cattle health, and the beef community is dedicated to keeping it that way through responsible use. Farmers and ranchers are committed to using the best practices available for cattle care. That commitment, combined with protocols including Food and Drug Administration (FDA) review, veterinarian oversight, electronic record-keeping, and resources like Beef Quality Assurance, add up to strong antibiotic stewardship practices on the farm. Not to mention the cost. At an average $30-$40 per dose to treat a large animal, it is cost prohibitive for farmers and ranchers to over-use antibiotics. There is no incentive for the over-use or misuse of antibiotics. But I've seen "antibiotic free" beef at my grocery store, why are some farmers using antibiotics when others do not? You may be seeing "antibiotic free" meat labels in your grocery store. To clarify, beef (or any meat, for that matter) sold in the United States is always "antibiotic free". Farmers and ranchers follow strict rules that do not allow cattle that have been treated with antibiotics to be shipped for slaughter before the label-designated withdrawal period is over. The antibiotic withdrawal period designates when the drug leaves the animal's system and there will be no antibiotic residue found in the meat. Realistically, a small percentage of cattle being raised on any farm will need to be given an antibiotic treatment. Withholding antibiotic treatment from a sick animal becomes an animal welfare issue. If an animal that lives on a farm that raises beef for an organic or "natural" program is treated with an antibiotic, it will, after the designated withdrawal period is reached and the animal is ready for slaughter, provide safe beef into the supply through a different label. The beef from an animal that was treated with antibiotics is just as safe as beef labeled organic, natural, or "antibiotic free". The beef community has been working with the U.S. Food and Drug Administration to implement changes that will restrict the use of antibiotics in livestock that are used in feed and water and are medically important to human health. The new guidelines formally took effect on January 1, 2017. Why are growth hormones used in beef cattle? This scientific advance has allowed farmers and ranchers to raise more beef with fewer cattle, using less natural resources. It has doubled our beef production from 13.2 billion pounds to 27 billion pounds, while decreasing the amount of land needed to feed cattle by 16 percent. It is a valuable tool in the ongoing effort to supply a growing population with beef in a sustainable way. They are safe for cattle and people. Decades of government review, science research studies and frequent evaluation of growth hormone use in cattle show the technology is safe for animals and humans. Each product must go through a stringent U.S. Food and Drug Administration approval and annual evaluation process. Despite the perception that growth hormones are used to "fatten up" cattle, they actually increase the amount of lean beef provided by the animal. Cattle that have been given growth promotants have decreased their fat percentage from 35% to 27%. What do cattle eat in a feedyard? Cattle, and their ruminant digestive system are a remarkable asset to food production! They take forage like pasture grass and hay that we cannot digest, and convert it to a delicious and highly significant source of protein and nutrients (zinc, iron, and B Vitamins to name a few) for us to enjoy. The fact is that just like humans, cattle require the right mix of protein, carbohydrates, fats, minerals and vitamins to help them thrive and grow. That healthy, balanced diet is often sourced based on locally available ingredients. This makes cattle feeding an asset in the reduction of food waste. Many processes crops go through for our benefit, for example, converting corn to ethanol, various vegetables into cooking oils, and making potatoes into french fries, create byproducts that can make up a healthy feed ration. These byproducts would otherwise become waste. This makes our food system on the whole more renewable, more local, and more sustainable. After cattle are weaned at 6-12 months of age (see the top of this page for information on the beef lifecycle), they are introduced to what is called a "ration", which is a mixture of different feeds. This ration is typically created in consultation with an animal nutritionist. The initial ration is made up of hay and forage crops with an introduction to high energy feeds such as corn, and the ratio is balanced and adjusted as they grow, with the goal of cattle converting the feed to lean muscle at an efficient rate. Grass/Hay: Grass can be cut and made into hay for livestock. Different types of hay will have varying levels of protein and fiber. 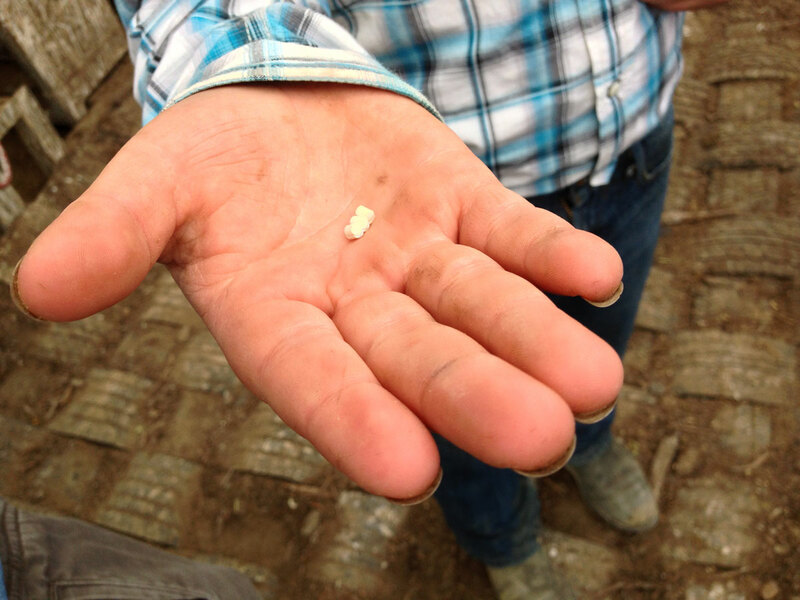 Sugar Beet Pellets: Pulp leftover from processing sugar beets into sugar for humans is made into pellets for feed for cattle and contains energy and fiber. Rolled Oats: Oats are a good source of fiber and can be fed during most stages of growth. Steam Flaked Corn: Corn is often processed with a steam-faker to make the nutrients easier to digest. Corn is a great source of energy. 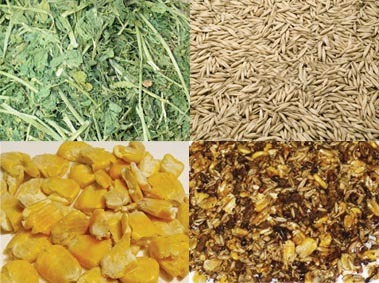 Mixed ration: A ration is a mixture of many feed sources (such as oats, corn, pellets and ground hay) to create a balanced diet for the cattle to include protein, energy and fiber. Watch this short video to learn more about what cattle eat at different stages in the lifecycle. A myth we sometimes hear is that cattle are "force-fed" to make them gain weight rapidly. This is patently false. Healthy cattle have a healthy appetite. Proper nutrition from the pasture to the feed bunk helps keep cattle healthy, eating and growing. Cattle move freely between eating, drinking fresh water, and resting throughout their lives. The short answer to this question is, yes. There are currently ten total crops grown from genetically modified seeds approved for use in the U.S.: corn, soybeans, cotton, canola, alfalfa, sugar beets, papaya, potatoes, apples and squash. Feeding of these crops (corn, soybeans, alfalfa) is common in raising cattle, and others more commonly fed in the form a byproduct from the processing for human use (cotton, canola, sugar beets, potatoes, and apples). Cattle feed made from these crops, grown from conventional or genetically modified seed may be used safely. In the current era of selling off start-ups and flipping real estate, farming and ranching is an outlier, grounded in the concept of passing the practice on from one generation to the next. Because resources like water and land are the most important factors in raising cattle, farmers and ranchers must be sustainability minded to succeed. Because environmental sustainability is so important to the future of raising beef, the beef community continues to invest in research that provides an accurate picture of the environmental impact of beef. While some claim "the old way" is better for the environment, Washington State University research comparing how we raised beef in 1977 versus 2007, shows a reduction in environmental impact - from greenhouse gas emissions to land and water use. About 85% of the land cattle graze in the U.S. is unsuitable for growing crops. Are Meatless Mondays better for me and the environment? Raising beef isn't sustainable? It's more sustainable than you think. What are the differences between grass-finished, grain-finished, natural, and organic beef? There are over 1 million independent farmers and ranchers raising beef in every state of the country, using their local resources to produce safe, delicious beef. For you, that means there are an abundance of beef choices available, including grass-finished, grain-finished, natural and certified organic beef. Click the graphic to download a PDF, and read on for common beef label definitions. Referring back to the Beef Lifecycle at the top of this section, beef cattle are raised on pasture with their mother to 6-12 months, and upon weaning may go to another pasture, farm, or feedyard, depending on the system that works for that rancher or in that geographical area. Beef labeling claims like "grass-fed" or "grain-fed" only refer to the "finishing" stage which is the last few months of the lifecycle where they are fed to reach slaughter weight of about 1200-1500 pounds. Cattle spend most of their lives grazing on pasture, then spend 4-6 months in a feedyard. They are free to eat a balanced diet of grasses, grains and other forages. Cattle spend their entire lives grazing on pasture or being fed a forage-only diet. Beef must be minimally processed and contain no added ingredients. Cattle can be grass or grain-finished. Look for label details to learn more about how it was raised ("no added hormones, no antibiotics, grass or grain-finished). Cattle can be grass or grain-finished, as long as the feed is 100% Certified Organic. Must be certified by USDA's Agricultural Marketing Service. Look for the official "USDA Organic" label. When a new brand or label of beef catches your eye, it's a great idea to do some additional research to understand what you are purchasing. Head to the brand's website where you will typically find more detail. If you are really curious about official labeling rules and definitions, check out the official USDA Meat and Poultry Labeling terms. Can beef be part of a heart healthy diet? When consumed in a healthy diet and active lifestyle, eating a serving of lean beef daily can have a positive impact on cholesterol levels. Plus, if a diet includes foods you love, like beef, you are more likely to keep those healthy habits going! Do you think that watching your cholesterol and heart health means you must avoid beef? Research shows that is not the case. In a study published in the American Journal of Clinical Nutrition, researchers from Penn State University found that people who participated in the Beef in an Optimal Lean Diet (BOLD) study, consuming lean beef daily as part of a heart-healthy diet, experienced a 10 percent decline in LDL "bad" cholesterol. The study evidence shows that eating lean beef every day, as part of a heart-healthy diet and lifestyle, can improve cholesterol profiles. The improvements in heart-health risk factors seen from the BOLD diets were as effective as those from the DASH diet and other heart-healthy diets. This alone is great news beef lovers. It reinforces that there is no one food that can promote or prevent good health. Healthy, whole foods like beef can be incorporated into a balanced diet and active lifestyle with positive health returns. The only thing left to do is to get some nutritious beef recipes and get cooking! There is no scientific evidence that beef, or any one food for that matter, causes cancer. Research shows the most important factors for cancer risk are avoiding smoking, maintaining a healthy body weight, and staying active. But in October 2015, The International Agency for Research on Cancer (IARC) released a report classifying "red and processed meats" as a "probable cause" of cancer. IARC is a committee of the World Health Organization (WHO). Their mission is to review existing research to determine potential causes of cancer and evaluate the carcinogenicity of substances. Fast Facts: What Do IARC's Findings on Red Meat and Cancer mean for you? There is divided scientific opinion, even among the committee who could not come to a unanimous consensus, on the hazard classification of red and processed meats. The report does not recommend avoiding red meat, or provide any insight into the amount of consumption and cancer risk. If you have questions about what you should be eating as part of an overall healthy lifestyle in order to decrease your risk of chronic disease, like cancer, the best advice is to follow a balanced diet and visit with your doctor, registered dietitian or other healthcare professional who can develop an overall healthy lifestyle plan that’s right for you. "As a registered dietitian and mother, my advice hasn’t changed. To improve all aspects of your health, eat a balanced diet, which includes lean meats like beef, maintain a healthy weight, be physically active and, please don’t smoke." Is beef a healthy source of protein? Beef is, by definition an "Excellent Source of Protein". At about 25 grams protein per 3 oz serving, it packs a lot of protein and added nutrients, without excessive calories. A 3 oz. 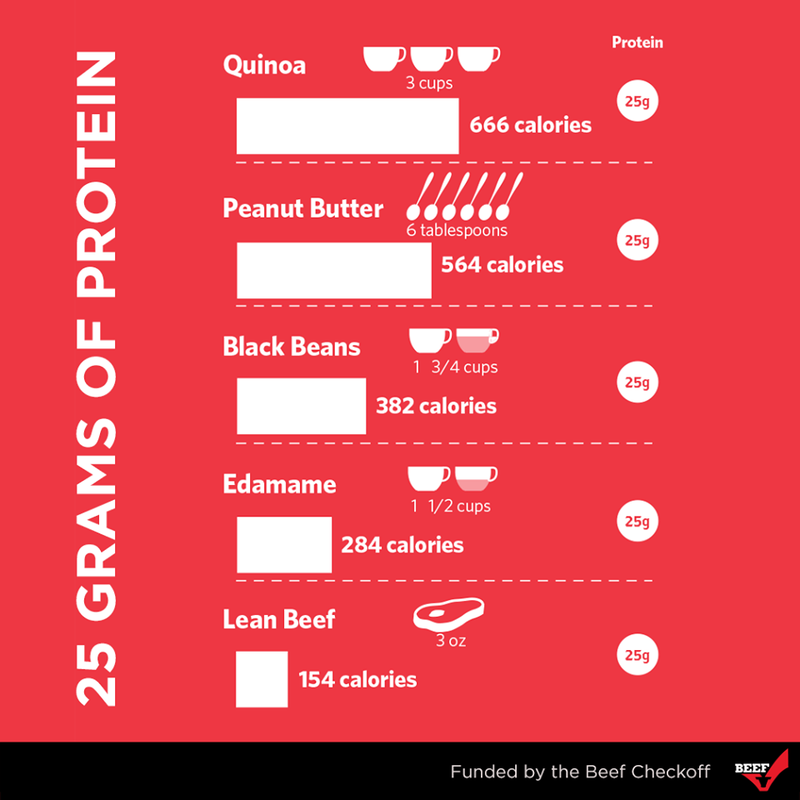 serving of lean beef, about the size of an iPhone provides almost half the recommended daily value of protein, and a significant amount of several other important nutrients. It is a complete protein that promotes the absorption of the other nutrients, and contributes to satiety. This feeling of fullness can prevent over-eating and snacking, so it can help you maintain a healthy weight. There are many dietary sources of protein. Consuming a balanced diet that includes all of the protein-rich foods you love is a great approach. Research shows balancing protein intake throughout the day to average 25-30 grams each meal provides the most benefit. While many plant based proteins compliment protein-dense beef in a healthy diet, substitution may not add up to adequate intake, unless more servings, and calories are consumed. In some cases, a lot more. What is the nutritional difference between grass-finished and grain-finished beef? There is very little nutritional difference between grass-finished and grain-finished beef. Both are nutrient-dense protein sources packed with 10 essential vitamins and minerals that are valuable to your healthy diet. Cuts of beef from grass-finished and grain-finished beef can both be lean. Lean beef has less than 10 grams of total fat and provides almost half the daily recommended value of protein in just 3 oz. and about 150 calories. While an animal’s diet can impact beef’s fatty acid profile, it remains primarily monounsaturated and saturated fatty acids regardless of the feeding practice. 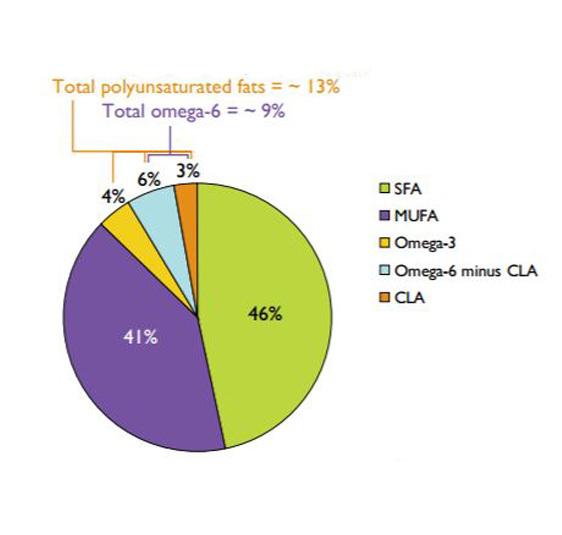 For example, extended grain feeding can actually increase the amount of monounsaturated fat, which has cholesterol-lowering effects.And, feeding grass longer can influence the amount of omega-3 fatty acid in beef. Either beef choice offers the same health benefits in a healthy, balanced diet. Half the fatty acids in beef are monounsaturated, the same heart-healthy kind found in olive oil. One-third of the saturated fat in beef is stearic acid, which has a neutral effect on blood cholesterol levels and is the same fat recognized in chocolate for its benefits. 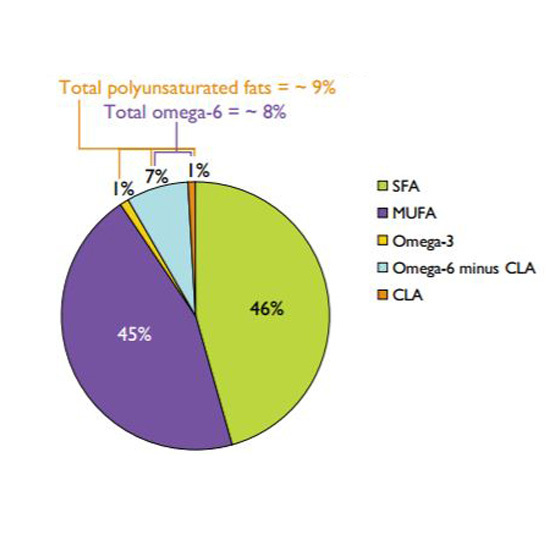 Polyunsaturated fatty acids represent the smallest class of lipids found in beef which include omega-3, omega-6 and conjugated linoleic acid (CLA). While all beef offers small amounts of omega-3 fatty acids and can contribute to omega-3 intake,the American Heart Association recommends fatty fish such as salmon as the primary source for omega-3 fatty acids. When it comes to beef, your choice, be it grass or grain-finished, is a good one for getting protein and 10 essential nutrients needed at every stage of your life. Is beef from cattle given antibiotics safe to eat? Farmers and ranchers follow veterinarian-developed protocols to determine if an animal needs an antibiotic to recover from a bacterial illness. When it is determined that antibiotics are needed, only FDA approved treatments are used, according to the label. Cattlemen then adhere to the label-designated withdrawal period and never ship cattle to slaughter prior to when the drug leaves the animal's system. If the beef from cattle shipped to slaughter tests positive for antibiotic residue, that beef is not put into the food supply, the farmer isn't paid, and he can be banned from selling cattle for slaughter. Farmers keep records of when cattle receive vaccinations, if they get sick, and any antibiotic treatments they've needed. Here, Sam Cossio explains treatment protocols and record-keeping at Easterday Ranches Feedyard in Eltopia, WA. Detailed records are kept to ensure cattle that have received and antibiotic are not shipped until the drug is out of it's system. Records are also used to track trends in cattle health, assess the health risks of cattle coming into the yard from different ranches, and evaluate antibiotic efficacy. Is beef from cattle given growth hormones safe to eat? Growth promoting hormones can be administered two ways. A farmer inserts a time-released pellet under the skin behind the animal's ear, or through feeding an approved supplement at an Acceptable Daily Intake (ADI) level. This level is set by the FDA. For more background on the scientific process, click here. What is being done to prevent E.Coli and other contamination in beef? The beef community invests $550 million a year in research and technology to improve beef safety. 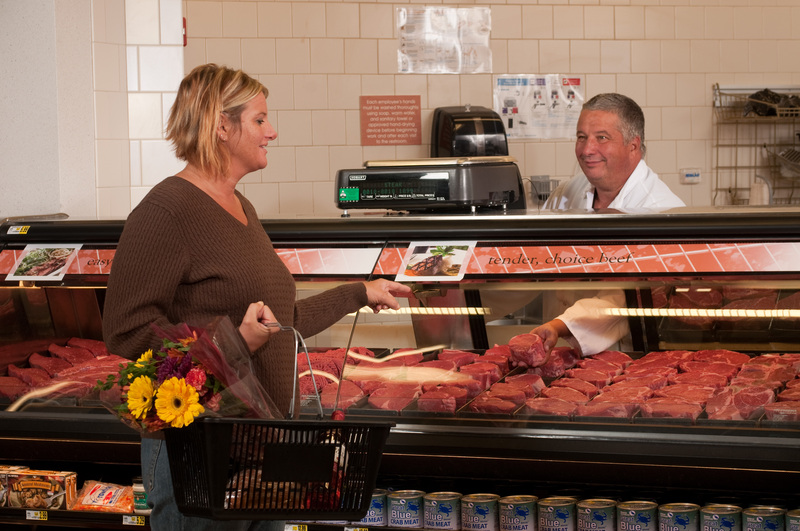 Providing safe beef to you is the top priority of the beef community. From the ranch through the processing stage, investments and advances are made to take advantage of practices and technologies that make beef safer. Get specifics on how the beef community has invested to prevent E. coli O157, Salmonella, and other foodborne pathogens from contaminating beef here. The food safety chain continues at home. Get the beef storage, safe-handling, and cooking information you need to prevent food-borne illness here. Why do I need to cook ground beef to 160 degrees? Q: "How would you like your burger cooked?" A: "To at least 160 degrees, please." Bacterial contamination of food can occur when it is exposed to the environment, processing equipment, or human handling. Food-borne pathogens such as E. coli are destroyed when exposed to high temperatures. Because the meat inside a ground beef patty, meatball, or crumble may have been exposed to bacteria during grinding or handling, to kill the bacteria, it must reach an internal temperature of at least 160 degrees Fahrenheit. The beef community is doing it's part to make your beef safe. Recommended cooking times are determined through food safety research that increases our understanding of how to prevent food-borne illness. You can do your part to prevent bacterial contamination and food-borne illness through proper beef storage, preparation, and cooking methods. We've put everything you need to know about choosing and cooking ground beef, all in one spot. Recipes. Freezing and thawing instructions. The differences between grind choices (80/20, 93/7, etc.). Click here and you'll be a ground beef guru in no time. 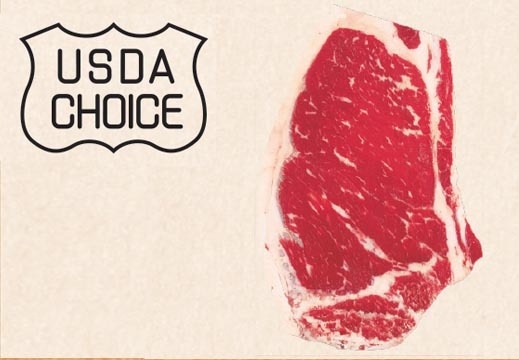 What do the USDA grades Prime, Choice, and Select mean? The USDA Food Safety and Inspection Service (FSIS) conducts both mandatory safety inspection at the slaughter plant, and voluntary quality grading that is paid for by the beef company. The quality grade assigned to each beef carcass is based on the amount of intramuscular fat, those "white flecks" or marbling present. 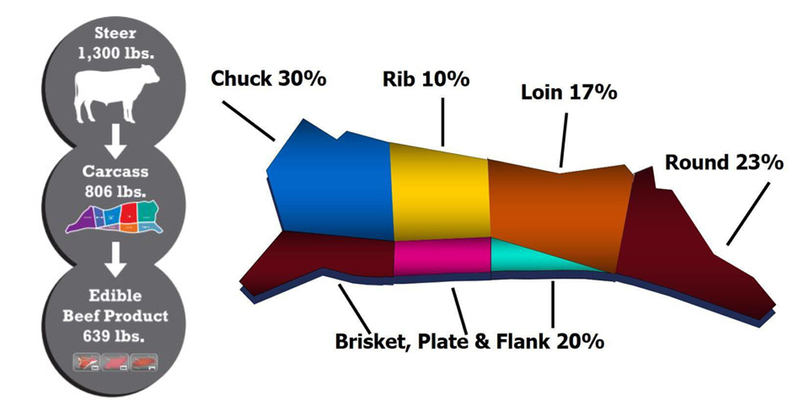 Each carcass is graded visually, and aided by Visual Imaging Analysis (VIA) between the 12th and 13th rib for consistency. Quality grade is determined by marbling because it is a good indicator of the tenderness and flavor potential of the beef from that carcass. The white flecks of fat liquefy during the cooking process, making the beef juicy and flavorful. Prime grade beef is produced from young, well-fed beef cattle. 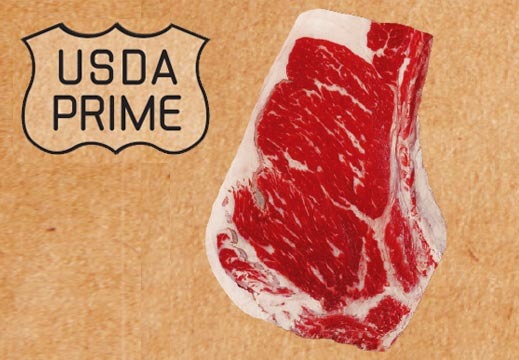 Only about 1%-2% of beef carcasses achieves a Prime grade. It has abundant marbling. Prime roasts and steaks are excellent for dry-heat cooking (broiling, roasting, or grilling). The premium eating experience, and rarity of Prime graded beef is what explains it's prime price tag and place at white tablecloth restaurants and steakhouses. Most of the beef sold by local retailers in the northwest is Choice. It is high quality, but has less marbling than Prime. Roasts and steaks from the loin and rib will be very tender, juicy, and flavorful for grilling and roasting. Cuts from the Round and Chuck may be best prepared by braising in liquid. Select beef is available at some local grocers. It is very uniform in quality and normally leaner than the higher grades. It is fairly tender, but, because it has less marbling, it may lack some of the juiciness and flavor of the higher grades. Only the tender cuts (loin, rib, sirloin) should be cooked with dry heat. Other cuts should be marinated before cooking or braised to obtain maximum tenderness and flavor. What do the beef labels Organic, Natural, and Grass-fed mean? Label claims like Organic, Natural and Grass-fed are intended to provide some insight into how the beef was raised. The USDA Food Safety and Inspection Service (FSIS) reviews and approves label and marketing claims on beef packaging. There are official definitions for Certified Organic and Natural beef labels. Here is a summary of common beef labels in the market and what they mean. Click the graphic for Today's Beef Choices, and read on for common beef label definitions. Referring back to the Beef Lifecycle at the top of the Beef Production section, beef cattle are raised on pasture with their mother to 6-12 months, and upon weaning may go to another pasture, farm, or feedyard, depending on the system that works for that rancher or in that geographical area. Beef labeling claims like "grass-fed" or "grain-fed" only refer to the "finishing" stage which is the last few months of the lifecycle where they are fed to reach slaughter weight of about 1200-1500 pounds. Because all beef cattle are raised on grass for the majority of their life, this label indicates the cattle do not receive any grains in the finishing stage. There is no official USDA FSIS label or inspection for Grass-Fed labeling. The USDA FSIS definition of Natural is "minimally processed with no additives." Most beef available for purchase fits this definition. 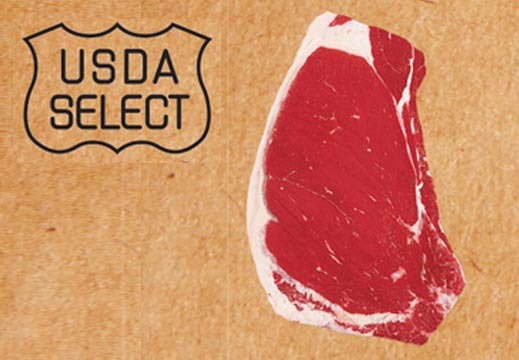 To determine what the label means in terms of beef production, refer to the brand's website, or additional labeling claims defined by the USDA such as "no hormones" or "no antibiotics". 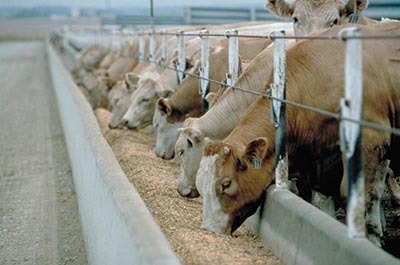 Beef may be grass or grain-finished, as long as feeds are organic. Look for the official green "USDA Organic" label. When a new brand or label of beef catches your eye, it's a great idea to do some additional research to understand what you are purchasing. Your butcher counter may have informational brochures to take home. Head to the brand's website where you will typically find a lot more detail. If you are really curious about official labeling rules and definitions, check out the list official USDA Meat and Poultry Labeling terms. Is it wrong to cook my steak to well-done? Talking about how we take our steak can end up as touchy as conversational no-no's like religion and politics. Probably because it's a personal preference (cue angry steak-knife wielding internet mobs). It's true, when it comes to tender steaks from the loin and rib, most trained chefs, ranchers, and butchers who know their way around the whole bovine, consider somewhere around medium-rare (130-140 degrees) the best way to optimize the natural flavor and juiciness of tender cuts. But you are free to order your beef or cook it at home how you like. 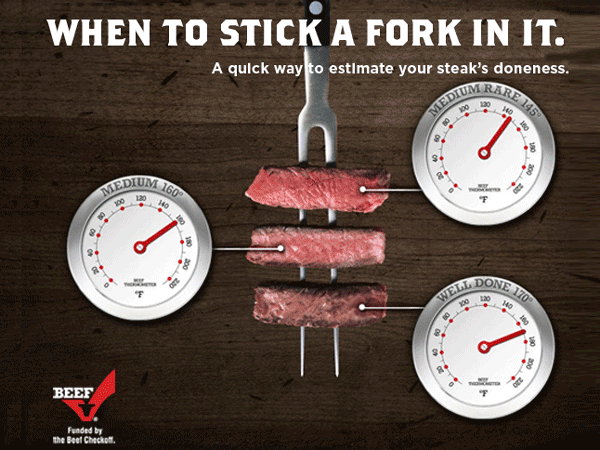 The keys to having a great experience every time are using a meat thermometer, and matching the best cooking method to the beef cut you've chosen. Experienced cooks have many tricks of the trade to achieving their desired doneness, but most of us mortals benefit from reading the actual internal temperature. 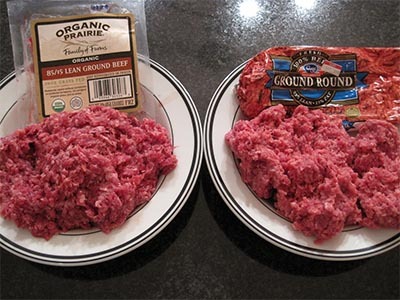 When it comes to ground beef, this is a food safety issue. Always order or cook ground beef to 160 degrees. The higher temperature will destroy any harmful bacteria such as E. coli 0157 that could be inside the meat. All beef cuts are created delicious, but not equal. Be sure to pick the cut that correlates with the type of meal you want to make. Save and refer to this Beef Cuts Chart to see recommended cooking methods for each cut. Follow our 3-Step guides (link) for success from the skillet to the grill and everything in between. Browse our recipes (link) to find some new family favorites. If I buy freezer beef, how much beef will I actually get? If you have ever purchased a quarter, a side or a whole beef carcass, chances are you have wondered why you have received less meat than expected. The average weight of a live steer or heifer ready for harvest is 1,300 pounds! So how much of this product should you expect to receive in edible meat products? What determines the price of beef? The beef community is working hard to supply beef to meet demand, at prices that consumers can afford. Resilient ranchers rebuilding their herds after drought and lower production costs are being passed on to consumers in the form of lower prices. Beef prices are a function of supply and demand. Tight supplies due to drought in states where about 45% of the U.S. cattle herd exists led to record high cattle and beef prices. A rebuilt herd (although still at the lowest levels since the 1950's), lower feed costs, and cattle sent to slaughter at larger weights is resulting in a larger amount of beef entering the market at lower prices. Prices haven't been this low in years, so it's a great time to enjoy a steak or a burger out, or stock up your freezer at home! Cycles of higher or lower prices due to changes in the cattle supply usually last for years, not months. The beef lifecycle is longer than for other animal protein sources like pork or poultry. It takes 2-4 years to see the results of herd increase reflected in the beef market, as ranchers retain as many heifers (female breeding stock) as possible, to produce more calves that then must be raised and fed before slaughter. Conversely, when production costs are high, or ranchers are squeezed by low cattle prices, heifers may be sold, adding to the supply, functionally keeping prices lower for a time.